This entry was posted on Sunday, March 8th, 2009 at 3:57 pm	and is filed under Fresh Spanish, Main Dishes, Moosewood Low-Fat Favorites, Sides, Spanish, Vegetarian. You can follow any responses to this entry through the RSS 2.0 feed. You can leave a response, or trackback from your own site. Beautiful meal. I love stuffed peppers. So many years since I made stuffed courgettes/ marrows when we had so many when they grew in the summer. I always stirred a bit of cheese sauce through the rice. With the soy, maybe you could try adding egg, so it was like egg fried rice? 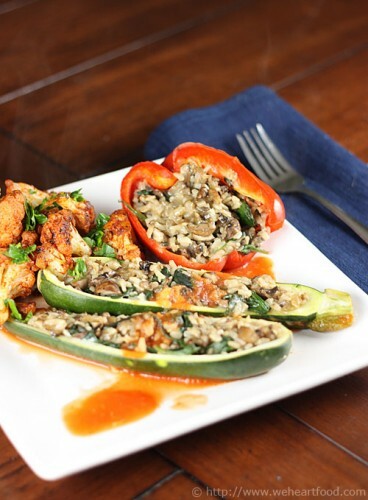 Love love stuffed vegetables! Your version looks absolutely delicious! a must try.